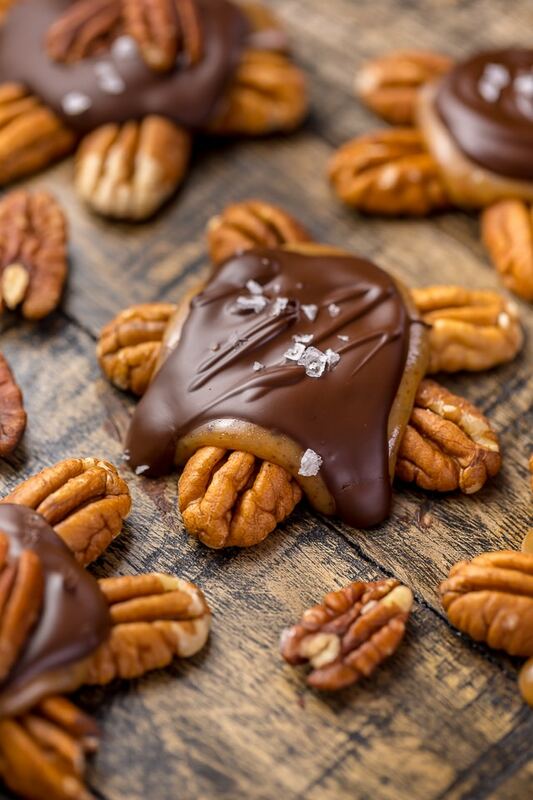 Today’s post for Dark Chocolate Salted Caramel Pecan Turtles is sponsored by the American Pecan Council. I’ve always loved Valentine’s Day. Even when I was a single lady! Because to me, it’s never been about the romance. But instead, a day I get to take stock of the special people in my life and shower them with affection… and CANDY! And if you know me at all, you know when I say candy, I mean homemade candy. 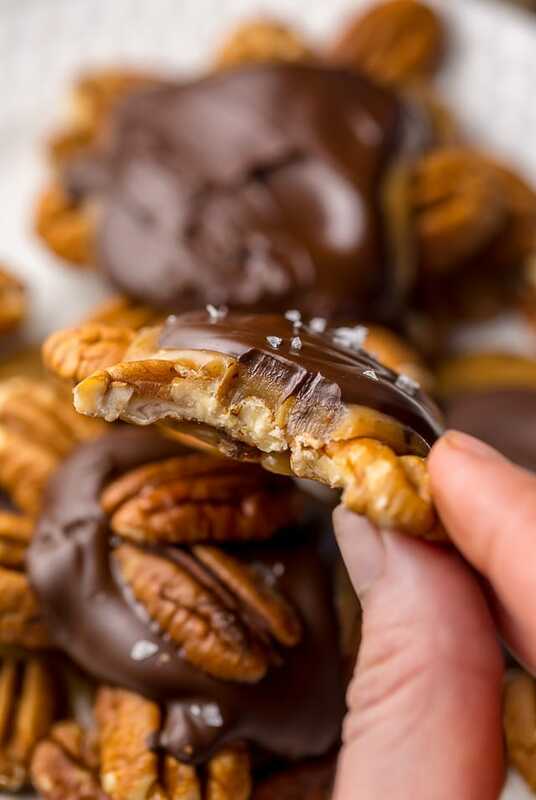 For this post, I’ve teamed up with my friends over at the American Pecan Council. I’m thrilled to partner with them because I’m a pecan fanatic and love creating new recipes featuring them! and super delicious?! Proof can be found here, here, here, and here. If you’re as pecan obsessed as I am, please head over to their website for fun facts, nutritional info, stories, recipes, and so much more! Trust me, you’ll love it! Now then, let’s get back to these adorable little turtle candies! Because they’re way too cute and delicious to ignore for another second. Bonus: they’re really easy to make! But to be sure yours come out absolutely perfect, I suggest reading my tips and tricks below! Speaking of pecans, you’re going to want to toast them before adding the caramel and chocolate. 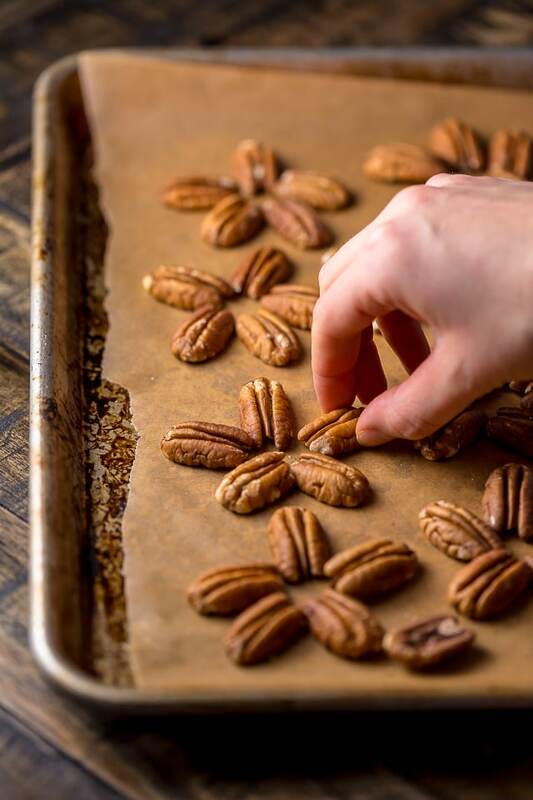 This simple step is really important because it enhances the pecans natural flavor and makes the finished product extra delicious. For the caramel, you’re going to need sugar, butter, sea salt, sweetened condensed milk, and light corn syrup. You’ll also need a candy thermometer! The caramel comes together quickly, so I suggest keeping a very close eye on it. Once you’ve removed it from heat you’ll want to let it sit for exactly 5 minutes before scooping it onto the pecans. 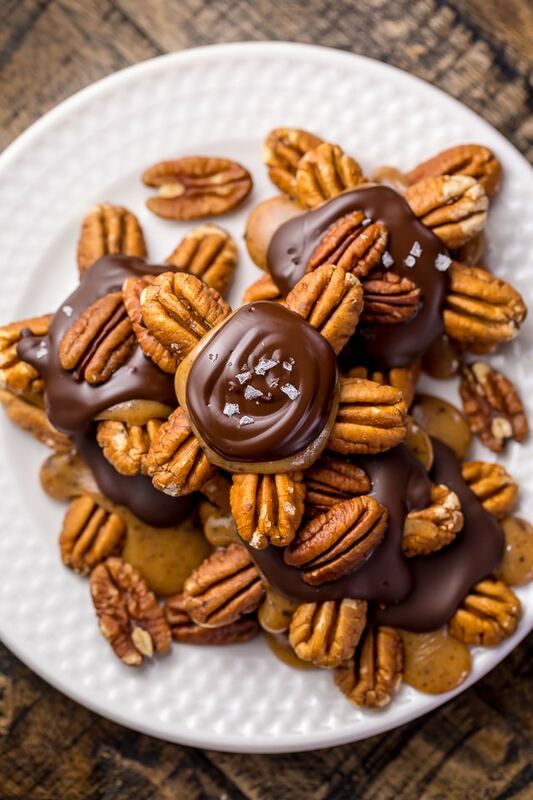 This short “resting” period allows the caramel to stiffen just enough so that it doesn’t run everywhere when you pour it over the pecan clusters. However if you let it sit too long, it will become too firm, so set a timer! I find the easiest way to evenly distribute the caramel is by using a medium cookie scoop. But if you don’t have one, a regular spoon will work! The turtles may just be different shapes and sizes. No biggie! Finally, let’s talk about the chocolate! Because I love dark chocolate, that’s what I used here. Plus, it’s heart healthy, which makes me feel good. But with that said, if you can’t handle the bitterness of dark chocolate, feel free to use semi-sweet chocolate instead. No matter what variety of chocolate you choose, please be sure to use REAL chocolate, and not chocolate chips, which are inferior in taste and texture for this type of recipe. 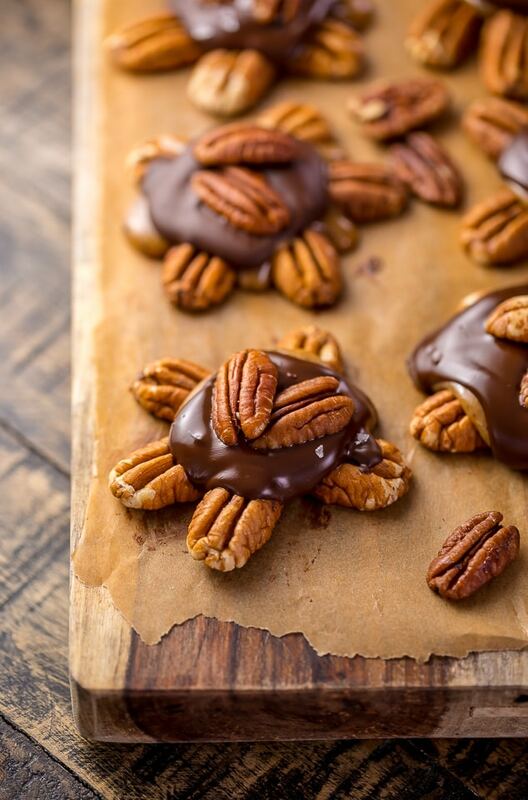 If you try this recipe for Dark Chocolate Salted Caramel Pecan Turtles, let me know! Leave a comment below and don’t forget to snap a pic and tag it #bakerbynature on instagram! Seeing your kitchen creations makes my day. 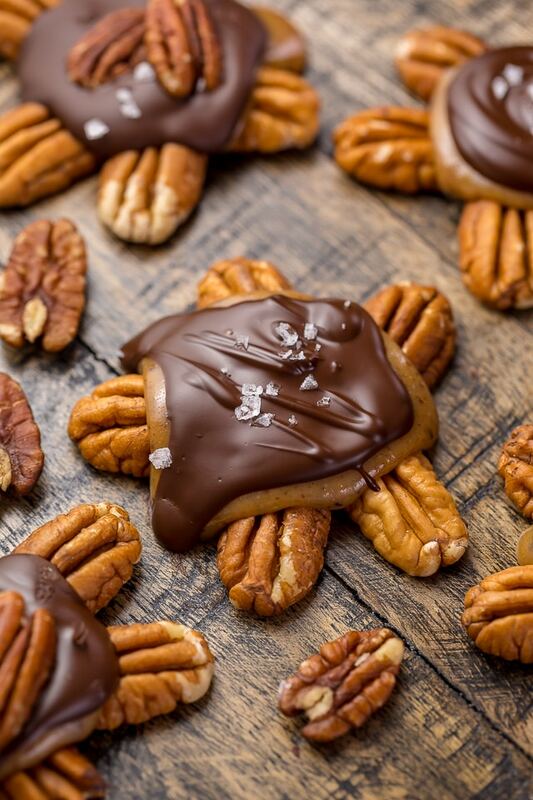 Making homemade pecan turtle candies couldn't be easier... or more fun! This recipe uses dark chocolate, salted caramel, and plenty of toasted pecans for the ultimate flavor combination. Preheat oven to 350°F. Spread the pecans on abaking sheet and toast them for 6 minutes, shaking the panhalfway through baking. Remove from oven and set asideto cool for a few minutes. Line 2 large baking sheets with parchment paper. Lightly grease the parchment paper with non-stick spray. Arrange the toasted pecans on the prepared sheets in star shaped groups of 5. Please see photo number 5 in above blog post if you need a visual on this. Set aside until needed. In a medium sized saucepan, melt the butter over medium heat. Once melted, add in the granulated sugar, corn syrup, sweetened condensed milk, and salt. Cook, stirring frequently, until the mixture reaches 235°F on your candy thermometer (also know as soft ball stage), about 8 minutes. Remove from heat and vigorously whisk the mixture for 30 seconds. Set aside for 5 minutes (set a timer!). Using a medium cookie scoop, spoon level mounds of the caramel over each nut cluster, aiming to drop it in the center of the cluster. Set aside while you melt your chocolate. Fill a medium pot one-third full with water and bring it to a low simmer over medium heat. Place a heatproof bowl that will fit on top of the pan snugly, but will not touch the simmering water, on top of the pan. Reduce the heat to low and add the chopped chocolate into the bowl over the pot. Heat until the chocolate is completely melted, stirring occasionallywith a silicon spatula. Once the chocolate is completely melted, stir the mixture smooth, then carefully remove the bowl from the heat. I LOVE pecans! These look so yummy! 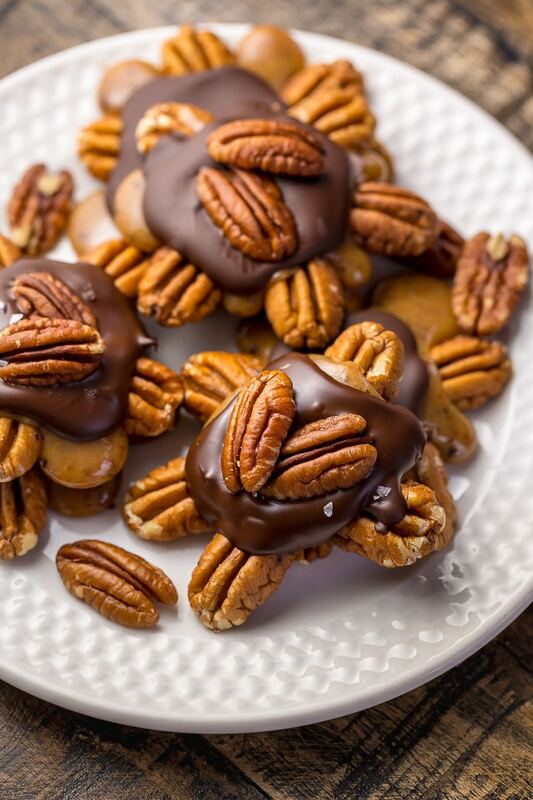 My goodness, these pecan turtles are yummy! AHHH YES! I love turtles and these are the epitome of the perfect ones! I love this recipe. I make turtles and I use a specially-sourced caramel (not the little squares at the market) and they are yummy. But your recipe looks easy enough that I am making my own caramel next time! And so many pecans!! Can’t wait to try it!